Who’d have thought you can find a 0 degrees Celcius spot in the heat of summer in Austria? 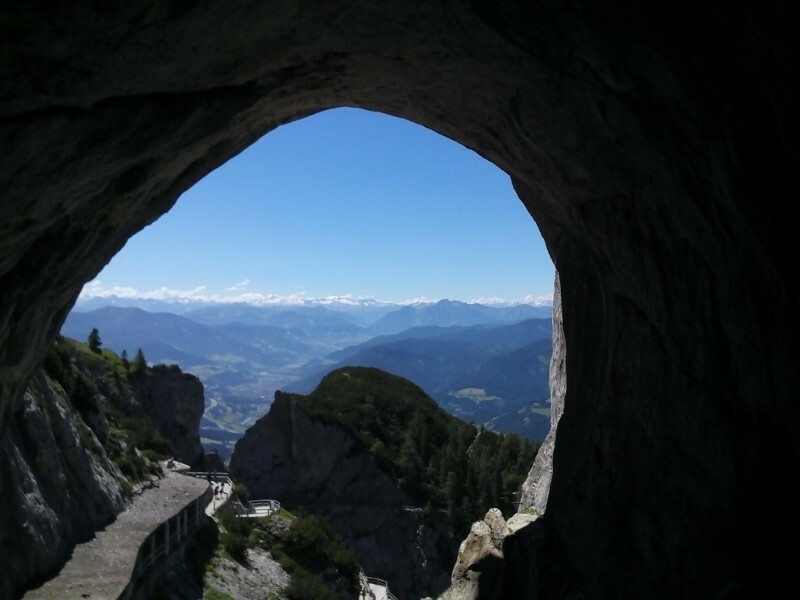 Well actually, we didn’t have to look too far from Salzburg and found it in the Eisriesenwelt (ice giants world) in Werfen. We were looking for something to do with two children (aged 10 and 13) on Sunday, and a day in a hot city did not sound promising. Instead, we drove the 35 minutes to Werfen, up the mountains for 5 km and stood at the entrance to the Eisriesenwelt. A short walk uphill, a 3-minute cable car ride and another short stroll uphill, and we were at the entrance of the cave, which is the biggest ice cave in the world. By that time alone we had climbed about 640 m. Most of that was via the extremely fast cable car though. We put on jackets (and sturdy boots for everybody but me as I had left my hiking boots in New Zealand since I wasn’t expecting an excursion to the mountains) and were ready to go underground. Once it was our turn for the tour, every 4th or 5th person received an old-fashioned carbide lamp to light the way. Since we are in Europe, nobody worried about people mishandling them. There were no accidents and nobody burned off the pants of another person. Entering the cave was a mission on its own as there was a wind blowing of at least 50 km/h once our tour guide opened the door. You really had to step through the door quickly and carefully, but as soon as you were inside, the wind was gone. The cave itself is about 42 km long, but only the first kilometer is the actual ice cave. After that it is too warm for ice to stay. In winter, the door to the cave is left open so that icy wind can enter, and in the spring the snow melt trickles water through cracks forming the ice sculptures little by little in the way that stalacmites and stalactites are formed. We went up 700 steps to reach the highest point in the cave (a walk of about 40 stories) that we could visit and down again 700 steps to return to our starting point. The biggest “piece” of ice in the cave is the ice wall and it’s about 25 m thick. The ice inside the cave has a commanding presence, and it is fascinating to see that much ice inside the mountain and also wander through a huge cave like that. Since we only had the carbide lamps, the lighting was sparse but still plenty and added to the atmosphere. It was amazing to see the effort that had gone into exploring this cave and also creating the walkways and stairs (there was generally one for ascending and one for descending). Everyone was pretty quiet in the cave taking the surroundings in and being in awe of what we saw there. The ice in the cave is mostly growing each year and the natural sculptures within it change all the time. What had been an elephant for the last many years is now slowly transforming into a dromedary. We could also see the growth of the ice over time clearly by looking at the layers in the ice. Our guide said though that in contrast to the rings in a tree, the layers in the ice can be added to or receed depending on the weather. Since you can’t take photos inside the cave, you’ll have to go there for yourself to check it out.